The ruling’s practical effect is far from clear. The plaintiffs’ attorney says it will raise the pay of thousands of people who work in the fields and orchards. But some industry representatives question whether the workers would see any net increase in take-home pay. 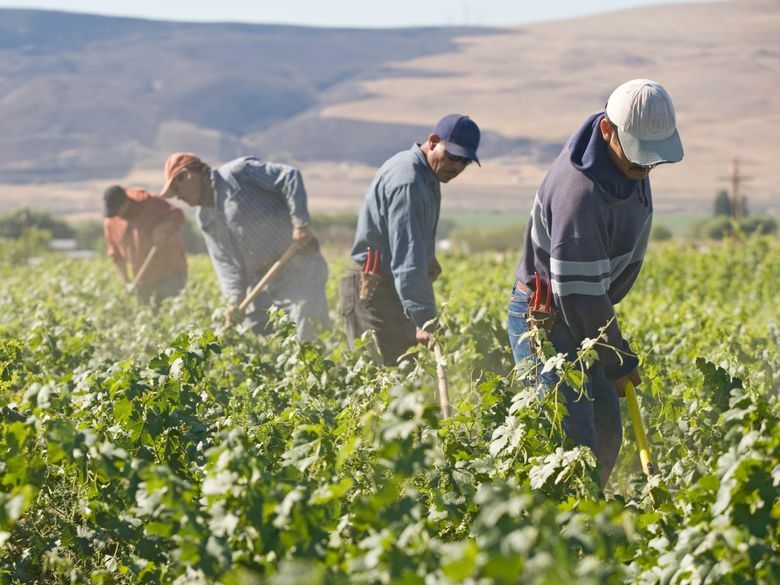 The Washington Supreme Court has ruled that farmworkers paid a piece rate as they labor in fields and orchards must get additional wages for their other tasks during the course of a workday. The 5-4 decision released Thursday affects wages in a vital part of the state’s economy: the agricultural industry that produces more than $10 billion of crops and livestock annually while employing nearly 100,000 farmworkers. While the ruling is considered a victory for farmworkers, its practical effect is far from clear. The plaintiffs’ attorney says it will raise the pay of thousands of people who perform hard work in the fields and orchards. Some industry representatives questioned whether the workers would end up seeing any net increase in take-home pay. The ruling puts new scrutiny on a farm-labor practice — piece rates — that ties wages to job productivity and are in widespread use during the fruit harvest season. The state Supreme Court found that the other tasks of piece-rate workers, such as unloading equipment at the day’s end or traveling between fields, should be tracked and then compensated through an hourly wage. “It should not come as a surprise to growers that you have to pay workers for all their work,” said Marc Cote, a Seattle-based attorney who filed the proposed class-action lawsuit in February 2016 on behalf of two Dovex Fruit Co. workers that led to the decision. Cote said employers already are compensating for such time. The ruling also was cheered by state Attorney General Bob Ferguson, who filed a friend-of-the-court brief to support the farmworkers’ position. It was unwelcome news to farmers. Dovex attorneys argued that as long as the weekly paycheck for piece-rate workers equaled or exceeded the minimum wage for the number of hours they labored, the growers were in compliance with state labor law. That position was backed by the dissenting judges on the state Supreme Court, but rejected in the majority opinion. “This is a big deal. The court has rewritten the law, and we are moving to a new compensation system,” said Dan Fazio, of Wafla, a farm-employers association. Mike Gempler, executive director of the Washington Growers League, says that the ruling risks pushing some operators away from a piece-rate system. That could harm the most productive workers, who under that system typically are able to earn well above what they would through an hourly-wage system. One big question still to be settled: just what types of farm labor require that additional wages be paid to the piece-rate workers. The state Supreme Court did not attempt to define all of that labor, and instead referred that question to the U.S. District Court for Eastern Washington. Until that question is answered, it is hard to know just how much unpaid time must be compensated. Cote said farmworkers have estimated to him that this type of work typically takes an extra 30 minutes or more a day. Growers say the time could vary a lot from farm to farm and crop to crop. As the lawsuit worked its way through the court system, some farmers already have changed their practices. Ric Valicoff, whose family has some 1,700 acres of orchards in the Yakima Valley, does not like the state Supreme Court ruling. He says his operation has purchased new software so hourly wages can be added to the paycheck of piece-rate workers.